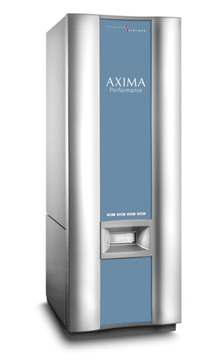 The AXIMA Performance™ is one of the most powerful tools in mass spectrometry, delivering information-rich spectra with greater sensitivity and higher confidence in identification. It is an extremely versatile and powerful TOF-TOF system, integrating workflows for a diverse range of analytical needs. The monoPULSE™ high performance, revolutionary ion gate provides outstanding MS/MS precursor ion selection resolution. High energy collision, together with the new design Curved Field Reflectron produce well balanced, information rich MS/MS data. The AximaPerformance™ demonstrates high resolution and mass accuracy across a wide mass range, from pharmaceutical compounds through peptides to high mass proteins, to enable a variety of applications in research environment.